While most New Zealanders supported their country’s participation in the First World War, a small but significant group opposed it on religious, political, philosophical or personal grounds. Sending New Zealand soldiers to serve in faraway war zones was accepted by most people so long as the men went voluntarily, but the introduction of conscription – which sent men against their will – threatened to shatter this broad consensus. Members of pacifist religious sects refused to take up arms, while militant socialists refused to fight for a capitalist system which, in their view, oppressed them. Irish nationalists had no desire to support the British government which occupied their homeland, and other people resisted war for reasons of their own. New Zealand’s leaders, committed to maintaining the flow of soldiers to the front, moved to shut down resistance and punish those who, as they saw it, were taking an unpatriotic and disruptive stance at a time of national crisis. The government used special wartime legislation to punish and imprison those who tried to foment organised resistance to the war effort, and to make examples of those who refused to ‘do their duty’. Conscripted men who refused military service were known as ‘conscientious objectors’, because their refusal to serve was based on their personal beliefs (or consciences). About 600 men declared conscientious objections, of whom around 286 were ultimately imprisoned in New Zealand as an example to other would-be objectors (others accepted non-combatant service or were exempt). Fourteen imprisoned objectors were forcibly despatched overseas in July 1917, with some ultimately transported to the Western Front and subjected to military punishments and incarceration. The broad question of dissent – and the specific experiences of ‘the 14’ – remain among the most controversial legacies of New Zealand’s First World War. On 1 August 1916 the Military Service Act, which enabled the government to conscript (‘call up’) any man of military age (20–45 years) for service in the New Zealand Expeditionary Force (NZEF), became law. The NZEF had been manned by volunteers since the start of the war two years earlier. It was expanded dramatically in 1915 and early 1916, by when the supply of volunteers had begun to run dry. In late 1915 the government conducted National Registration, a manpower census designed to find out how many eligible men remained. This process – and a follow-up recruiting drive – showed that while the men were there, they were not coming forward willingly. In early 1916 the government followed that of the United Kingdom in deciding to introduce conscription, in the face of mounting protest from anti-militarist and labour opponents. Men were to be called up in every month from November 1916 to October 1918 – first single men, then childless married men and eventually men with children. The New Zealand government called up a total of 138,034 men for military service under conscription. Every man could appeal against his call-up through his local Military Service Board, which was empowered to exempt men on the grounds they worked in an essential industry, that their enlistment would cause ‘undue hardship’ to their family, or that they were a member of a pacifist religious group. During the war the boards heard 32,445 appeals (historian David Littlewood puts the figure as high as 43,544) and offered provisional exemptions to 11,343 men on the grounds of essential industry or undue hardship. Only 60 men were granted exemptions on religious grounds; another 13 rejected exemptions they were offered. Some 32,270 conscripts had been been sent to camp to serve in the NZEF by the end of the war, of whom 19,548 ultimately embarked for the front. The press and public had been debating the prospect of conscription for at least a year by the time the question came before Parliament in May 1916. Many New Zealanders saw this as the best way to ensure ‘equality of sacrifice’ across the whole of society, but some characterised it as an outrageous violation of individual civil rights and a move towards the militarisation of society. The principal critics of conscription were people from labour organisations and Christian sects with pacifist leanings. Labour groups feared that compulsory service would exploit workers and diminish their rights. Men at the socialist end of the labour spectrum expressed loyalty to the working classes of other countries, rather than to their own national leaders – who embodied the capitalist system which, in their view, oppressed them. Labour leaders demanded that any conscription of men be preceded by a ‘conscription of wealth’, with capitalists forced to surrender at least some of their assets to fund proper wages for soldiers and their dependants. The Christian groups protested that bearing arms was contrary to the will of God, and that forcing the young into uniform would undermine parental and biblical authority and promote violence. A number of militant labour groups threatened large-scale organised strike action if conscription was introduced, which could compromise the country’s ability to maintain its war effort. Anti-militarist groups held rallies, issued pamphlets, and tried to stir up public opposition to conscription. The Military Service Act passed nonetheless, and the first ballot was held in mid-November 1916. Australians voted against conscription in a referendum in late October, giving more impetus to anti-conscription sentiment in New Zealand. Minister of Defence James Allen believed that open debate in Australia had defeated conscription, and made sure that New Zealanders were given no similar opportunity. Public debate was further muzzled by the passing of new War Regulations in early December 1916. These banned public criticism of conscription in such sweeping terms that even mild remarks could result in prison sentences. A wave of strikes did follow the introduction of conscription, but they were disorganised and had no significant impact on industry. The War Regulations stifled public protest, and by April 1917 industrial action had effectively been quelled. 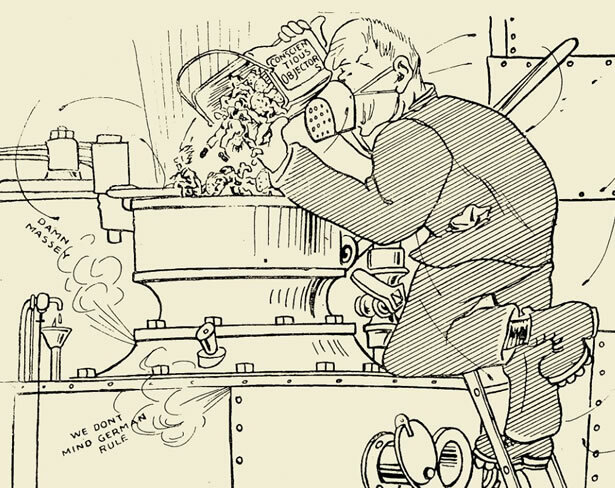 In February the government introduced further regulations prohibiting ‘seditious strikes’, enabling it to clamp down on industrial action in any industry essential to the war effort. Between 1915 and 1918, 88 people were convicted under the War Regulations of making ‘seditious’ or ‘disloyal’ statements, while a further 14 were convicted of inciting or participating in seditious strikes. Sixty-seven of these convictions resulted in prison sentences, with labour leaders prominent among them. Organised resistance to conscription may have been defeated, but individual resistance continued. Some conscripted men objected to serving in the NZEF on religious, political, philosophical or other grounds. The Defence Department ensured that the criterion for religious exemption was kept narrow, to stop the unscrupulous using this as a way to avoid service. Many men with genuine religious scruples about military service were ineligible for exemption. The department discreetly offered non-combatant service in the Medical Corps or Army Service Corps to any man who objected to bearing arms, on the grounds that they could thereby still make a positive contribution to the war effort. About 350 men took this option. Even the lucky few exempted on religious grounds were still expected to undertake some form of non-military service in New Zealand, to ensure some kind of rough equivalence of public service. The Defence Department had little patience or sympathy for conscripts who explicitly rejected all forms of military service. Such men were known as ‘conscientious objectors’, because they placed their own consciences and beliefs before the demands of the state. Typically a conscientious objector would refuse to accept his military kit on arrival at camp, and be given a short period of imprisonment during which to reconsider his position. If he maintained his objection on release, he would be court-martialled and imprisoned for up to two years for ‘disobeying a lawful command’. See full list of imprisoned conscientious objectors here. Of the 286 objectors imprisoned between early 1917 and the Armistice in November 1918, more than half were motivated by religious concerns. Many were members of small sects such as Testimony of Jesus and Church of Christ, which fell just outside the Military Service Act’s exemption criteria. Others were members of mainstream churches who used biblical texts to argue that military conflict was against God’s will. About a quarter of the imprisoned objectors professed socialist beliefs, favouring class warfare over international warfare. Around 10% were Irish nationalists who refused to fight for the empire which oppressed and occupied their homeland, while around 5% were Waikato Māori conscripts who had a similar view of the New Zealand government. Among the remaining few was a mentally ill man and a man who openly admitted he preferred imprisonment in New Zealand to death in France. Opting for prison over military service was no easy way out, however. Almost all the objectors were sentenced to hard labour, meaning they were set to work building roads and bridges or planting trees in inhospitable areas like the Waimarino district. Their families received no income and were left to fend for themselves while their breadwinners were incarcerated. Other men avoided military service by not showing up when they were balloted, risking three years in prison. Some hid out in remote bush camps, while others found work with sympathetic back-country farmers or fled the country. Some deserted the NZEF during their training period, more than once in some instances. The Defence Department’s branch dedicated to tracking down such men investigated more than 10,000 cases of defaulting and desertion (the majority were found to have legitimate reasons for having missed their calling up). It arrested around 580 men, and warrants for another 1133 were still outstanding when the war ended. In mid-1917 the Defence Department reviewed the objectors then incarcerated and decided that those who still rejected all forms of military service would be sent overseas on the next troopship. The department labelled such men ‘defiant objectors’, believing they were motivated by stubbornness rather than ‘genuine’ religious scruples. The conscription process was intended to ensure equal sacrifice across society, so 14 imprisoned objectors were selected to be sent abroad to be treated like any other soldier. Their forced deportation would be proof of the department’s commitment to buttressing the conscription system against those trying to find a way around it. The 14 men had been amongst the earliest to make a stand against conscription. More than half of them had been called up under the ‘family shirker’ clause rather than selected at random by the ballot – they had been deliberately singled out by the military authorities of their district to make an example of them as unpatriotic objectors. The group was drawn mainly from labouring and industrial workers, and included three brothers – Alexander (Sandy), Archibald and John Baxter of Brighton, Otago. The men left New Zealand aboard the troopship Waitemata on 14 July 1917, imprisoned in the ship’s lockup. They were stripped and forced into military uniform. On the second leg of the journey some were forced to wear towels as loincloths when they again refused to don uniform. The men were imprisoned at Sling Camp in Wiltshire, where bleak conditions and illness forced three of them to submit (another was recognised as a ‘genuine’ religious objector under the Military Service Act and returned to New Zealand). The remaining 10 objectors were despatched to France in late 1917 and early 1918. Four more were persuaded to don uniform by the authorities in France, leaving six to face the rigours of military field punishment. Three were sentenced to terms of imprisonment, which they served in an exceptionally brutal military prison at Dunkirk. All subsequently agreed to act as stretcher bearers and one, William Little, was later killed in action. The last four objectors, Henry Patton, Lawrence Kirwan, Mark Briggs, and Archibald Baxter, were all sentenced to the most serious punishment short of imprisonment: Field Punishment No. 1. In principle this involved a standing man being tied loosely to a pole by his hands, but in practice the sloping poles forced men into a hanging position which cut off circulation to the hands and caused extreme pain. After Patton agreed to serve as a stretcher bearer, the final three were ordered into the front-line trenches. In practice this meant only walking up to the front lines, which Briggs alone refused to do. His punishment involved being dragged over rough ground and duck walks before being thrown in a shell hole. He was severely injured, and hospitalised and discharged as a result. Kirwan now agreed to be a stretcher bearer. Archibald Baxter, the sole remaining objector, was slowly starved and sent into dangerous areas in the apparent hope he would be killed. When his health collapsed from the effects of starvation and a particularly brutal beating from an officer, he was hospitalised. Military doctors in England diagnosed him as insane, a diagnosis he later contested. A few months later he was returned to New Zealand as medically unfit. Baxter’s account of his experiences at the front makes clear that many of those in whose custody he was placed had little idea what to do with him. There was no precedent for managing non-combatants at the busy and volatile front, and no clear guidelines for doing so. He spent most of his time hanging around base between bursts of punishment and persecution – usually from officers, who were responsible for maintaining group discipline. The ordinary soldiers he came into contact with regarded him with a mixture of fascination, contempt, sympathy and indifference. Allen and at least some of the senior officers dealing with the 14 realised that public perceptions of the episode would need to be managed carefully. They wanted the men to be regarded as shirkers being justly forced to do their bit by a fair-minded state, rather than sensitive men of principle being brutalised and tortured by hard-hearted and punitive officials. In this regard the Department was disappointed. News of the 14’s deportation leaked to family members and the press a few months after the Waitemata’s departure, including stories that the men had been mistreated aboard ship. The furore grew when rumours of field punishments and brutal incarceration reached New Zealand in the autumn of 1918. Anti-militarists attacked the callousness of Allen and his department, accusing them of indulging in the sort of draconian ‘un-British’ practices of which the Germans were guilty, and which the war was in part intended to abolish. Allen never conceded that the department had made a mistake in deporting the men, but, as his critics pointed out, the experiment had not been repeated. Why, they persisted, had the 14 been put through far harsher punishments than objectors serving sentences in New Zealand for identical crimes? Allen could provide no satisfactory response to these accusations, nor to questions about why three sons of a single family should have been sent. New allegations in May 1918 fanned the public backlash. A military detention barracks in Whanganui had been established a few months earlier. Warder J.L. Crampton and his staff had made it a personal project to harass imprisoned objectors until they agreed to serve. Stories of brutal beatings and mistreatment inflamed a public already shocked by stories of the 14, and further undermined the Defence Department’s credibility. Anti-militarist groups launched organised publicity campaigns, and Labour candidate Harry Holland lambasted the government’s hard-heartedness from the hustings during the Grey by-election. Shortfalls in Māori units in France saw conscription extended to Māori in late 1917 and the first ‘Maori ballot’ conducted in May 1918. The government limited the ballot to the Waikato district, which to date had produced few recruits. Allen was motivated by a belief that all sections of the community should be forced to play their part, but Waikato Māori resisted enlistment because of historical grievances going back to the land confiscation of the 1860s. When only a few of the 552 conscripted Māori presented themselves for military service, a raid on Te Paina marae in Mercer saw 14 men arrested and imprisoned. The war ended before any of the Waikato conscripts could be sent overseas. Read our main article on Māori conscription. Most of the imprisoned objectors were still behind bars at the time of the Armistice in November 1918, some serving their second or even third consecutive sentence for refusing military service. Almost immediately, labour and anti-militarist groups began campaigning for the objectors’ release (the 14 were gradually discharged in late 1918 and early 1919 without further punishment or penalty). Returned servicemen’s associations were implacably opposed to any leniency being shown to objectors. Allen remained firm in his resolve to punish those who had refused to serve. He recognised that some of the men held genuine convictions, but was convinced that those who had refused even non-combatant service were, at best, misguided. He believed that the country’s real debt was to its servicemen, who should be given the opportunity to return home and get established before objectors – who had contributed nothing to the war effort – were given the same privilege. Allen and other officials had a degree of sympathy for men who presented religious objections to war, and Allen’s correspondence makes clear his belief that a genuine conscience could only develop through religious study. He had no sympathy for socialist or Irish objectors, whom he regarded as selfish and unprincipled trouble-makers. In early 1919 he created a Religious Advisory Board to identify ‘genuine’ religious cases among the objectors and remitted sentences on the board's recommendation. The rest of the men – including another 113 sentenced after the Armistice for deserting and defaulting – remained in prison, serving out their sentences. The last of the imprisoned objectors was released from prison in August 1920, and three months later an amnesty was declared for all defaulters still at large. Parliament decided in late 1918 that men who had failed to serve their country in wartime – imprisoned objectors (other than religious objectors), deserters, and men who failed to appear when called upon – would lose some of their rights as citizens for a period of 10 years. The ‘defaulters list’, first published in May 1919, named 2320 defaulters, after 99 names had been deleted on appeal. No defaulter would be permitted to hold any government or local body job, to seek election to Parliament or any other authority, or to vote in any election. All the defaulters had their civil rights restored in September 1927, a year earlier than the legislation had originally allowed. This spreadsheet lists the 286 conscientious objectors who were imprisoned for rejecting military service during the First World War. It lists the dates they were balloted, sentenced and released, and provides other biographical and procedural information. It also records their reasons for rejecting military service, where this information is available. The list is based on original research by NZHistory. This spreadsheet records the wartime convictions of 102 New Zealanders for making seditious statements or supporting a ‘seditious strike’. It lists names, occupations, approximate years of birth, charges, dates and places of prosecution, and date of release from incarceration of each individual. The list is based on original research by NZHistory. In 1919 the government appointed a Religious Advisory Board to interview the conscientious objectors who had been imprisoned during the First World War. The board was asked to provide a list of all the objectors whose refusal to serve had been motivated by religious concerns. These men, whom the government judged to have a more defensible rationale for rejecting military service than those with political motivations, would be released from prison early without further punishment. Those objectors not categorised as religious by the board remained in prison and were placed on the defaulters’ list, losing certain civil rights for 10 years. The board’s report provides the most detailed analysis of individual objectors and is an important source for First World War researchers and genealogists. It includes (1) a summary of the board’s recommendations by individual; (2) notes on the interviews with each objector; (3) a list of all the objectors released in August 1919 as a result of the board’s report. The report covers only the 273 objectors who remained incarcerated in early 1919. In May 1919 the government published a Military Defaulters List, containing the names of men it considered had failed to perform their civic duties under the conscription system during the First World War. This included men who had directly refused military service (conscientious objectors), those who deserted from the New Zealand Expeditionary Force, and those who failed to present themselves for military service when called upon to do so. Conscientious objectors who had refused military service on religious grounds were exempt from inclusion in the list. Defence Minister James Allen was the person most directly responsible for administering the conscription process. Conscientious objector Archibald Baxter was one of the 14 men deported to the front in 1917, and his memoir We Will Not Cease provides a graphic account of his experiences. Auckland electrician George Billings refused military service on religious grounds and was imprisoned for two years as a result. Mark Briggs endured imprisonment, illness, and physical punishment as one of the 14 men deported to the front in 1917. Alfred Davis was sentenced to three months in prison in 1918 for helping his brother avoid military service. Labour leader – and future prime minister – was imprisoned for 12 months for ‘seditious’ anti-war comments in December 1916. Waterside labour Joseph Jones served prison sentences for an anti-war speech and later for refusing military service. The police arrested Tuhoe leader Rua Kenana in 1916, probably suspecting he was dissuading his followers from enlisting in the armed forces. Labourer Roy Lambess deserted from training camp on four occasions between 1916 and 1918. Russian watersider Ernest Lynd, sentenced to 11 months in prison for seditious comments, complained that the police harassed him because he was a foreigner. Socialist objector Duncan McCormack recalled his wartime imprisonment for Radio New Zealand in 1979. John O’Neill served a prison sentence for sedition before evading the draft for several months. Finally forced into uniform, O’Neill died at Trentham Camp in the influenza pandemic of November 1918. Alphonsus Parsons served prison sentences for both seditious utterances and refusing military service. Bushman Thomas Simpkins was sentenced to 12 days in prison in May 1918 for failing to enrol for the ballot. One of conscription’s most prominent critics, parliamentarian Paddy Webb served prison sentences for both seditious utterances and refusing military service. Union secretary W.T. Young served three months in prison in 1917 for ‘inciting a seditious strike’. Young maintained that the government was using the war regulations to silence its political opponents. Baker, Paul. King and Country Call – New Zealanders, Conscription and the Great War. Auckland: Auckland University Press, 1988. Grant, David. Field Punishment No. 1: Archibald Baxter, Mark Briggs & New Zealand’s Anti-militarist Tradition. Wellington: Steele Roberts, 2008. Baxter, Archibald McColl Learmond, a biography of Archibald Baxter on Te Ara. Interviews with Duncan McCormack and Millicent Baxter (on Archibald Baxter) from Ngā Taonga Sound and Vision. Hear Chief Historian Neill Atkinson discuss First World War conscientious objection and dissent on Radio New Zealand, 29 Aug 2016. We have 2 events in history, 25 biographies, 40 articles, related to Conscientious objection and dissent.